"The greatest assemblage of royalty...ever gathered in one place and of its kind, the last," as Barbara Tuchman pointed out, was the funeral of Edward VII in May, 1910. Nine kings, seven queens, and dozens of other "highnesses" gathered to pay their respects to the man known as "the uncle of Europe." Their common heritage was Edwardd's mother Victoria, England's queen from 1837 to 1901, who had populated the courts of Europe with nine sons and daughters. Many of the mourners were, quite literally, cousins. None of them recognized, just then, that within four years their world would be at war with itself. Three of the cousins, George V (King of England 1910-36), Nicholas II of Russia (Tsar 1894-1918) and Wilhelm II of Germany (Kaiser 1888-1918), maintained a friendly correspondence. Their "Dear Nicky" and "Dear Willy" letters make fascinating diplomatic reading, and show that with a little effort they alone may have averted the war. America, of course, did not enter the fighting until it declared war on Germany in April 1917, and first had to raise an army before sending troops to Europe. 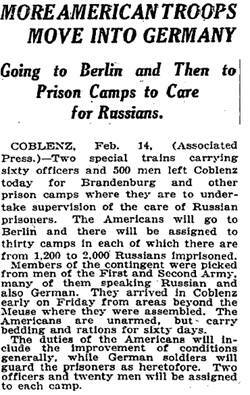 When they arrived, it became another kind of "cousins' war." The level of immigration to the United States fluctuated throughout the nation's history, but reached its peak in the period from 1880 to 1924. And although this wave has been characterized broadly as coming from southern and eastern Europe, the Census Bureau had begun to take notice and to a very accurate degree was able to measure the influx from particular countries. The 1910 Census, for example, found that 57% of the foreign-born U.S. population was from "Northwestern Europe," with the largest number (more than 2.5 million) coming from Germany. The Bureau did not use the term "German" because many ethnic Germans may have come from Austria, Switzerland, or Russia. 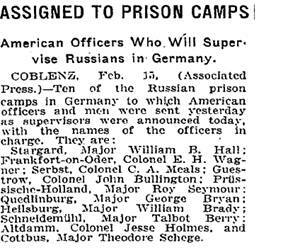 An enormous number of US draftees, German-Americans, found themselves in a difficult situation. They were attacked in their adopted homeland by those (like ambassador James W. Gerard, for one) who railed against "the Hun" and the "German-American peril," and forced to confront their "cousins" (real and metaphorical) in the trenches of Europe. about forty-eight years of age, of short and stocky build. Although German was predominant in his nationality, I doubt whether the officer himself was certain of his ancestry. Uneducated except in army affairs, he spoke rather brokenly, with the grammatical mistakes of a child. His appearance was such that on first contact one would naturally class him as a "tough old bird" or a "hard one," and such did strangers almost invariably consider him. Contrary to Joel's comment, Schoge was certain of his ancestry. Capt. 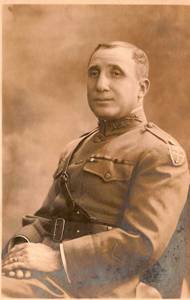 Schoge's service in France with the 314th Infantry Regiment (79th Division) earned him a Silver Star, a French Croix de Guerre, and promotion to Major. 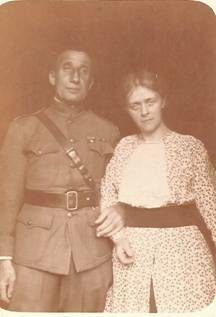 His military experience, his rank, and no doubt his fluency in German (his native tongue) are what got him chosen to be one of those in charge of demobilizing Germanyy's POW camps and repatriating the inmates. The Allies recognized his value. The German officers who ran the Cottbus / Guben camps saw Major Schoge as a Landsmann, a compatriot, and were thus more sympathetic to him than they would have been to another sort of victor. "For Major Schoge, as a souvenir of our common service time spent together in the Prisoner of War Camp Guben. 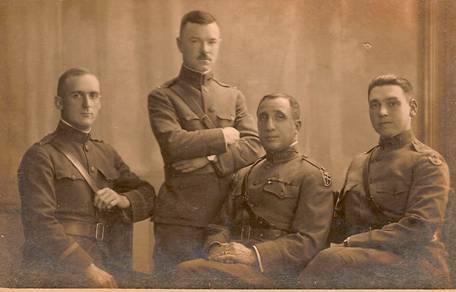 (signed) Fischer, Major and Camp Commandant. 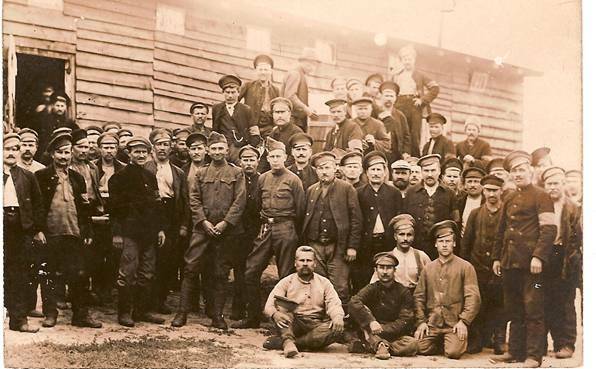 The 150 photos inside offer a captioned, thorough, and possibly unique, view of the Guben camp, located on the German-Polish border and filled with prisoners of seemingly every Allied nation. 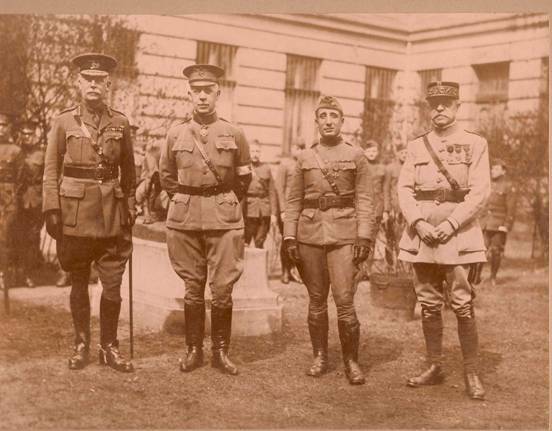 Maj. Schoge and his lieutenants; Walter Bryan at left, Charles Lumm (Medical Corps) standing; man at right unidentified. And while in Germany, Schoge experienced the literal sort of cousins' war: he revisited the city of his birth. He went sightseeing (we have postcards and brochures), visited with his cousin Olga and her family (we have inscribed photos), and fraternized with at least two different women (we have their photos and love notes). But the photo album of the Guben POW camp provides valuable documentation of the cousins' war and its aftermath.